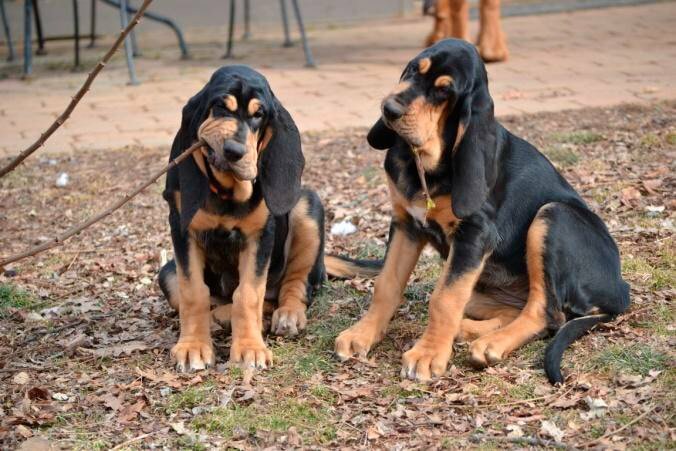 Looking for a Bloodhound Puppy? Bloodhounds are sort of like a bag of potato chips; open a bag and empty the contents onto a table top, and you will see a lot of general physical similarity, but then as you sort through the pile and look closer, you will notice some differences to the chip edges, shapes and sizes. In other words, they somewhat fit that "bell curve" graph from science and math class, in that most of them generally behave and react similarly, but we have tail ends on both sides of that middle section, and each of these ends are as different as night and day. These "ends" will require a certain type of home with a certain type of owner. To understand the varied Bloodhound personality, you have to bear in mind the breed’s original purpose, which is that of a "scent hound." The nose rules this breed; the independence, the stubbornness, the inquisitiveness, and their exuberance. In the breed’s early years, these hounds lived as pack animals and worked independently of humans. When they were successful, all of the humans thrived, so those hounds with the drive to work and stubbornness to get to the trail’s end were naturally desired and promoted. A pack by its nature has an alpha, alpha-want-to-be(s), the side-kicks or followers, and the stragglers who reluctantly come along, but would really prefer to remain home. As a Bloodhound owner, you will interact slightly differently with your hound, depending on which pack personality you happen to have. Like the potato chips, they may look pretty similar, but there are differences amongst them. Exercise can really make the difference in successfully getting through the first two to three years of a Bloodhound’s life, but it needs to be age appropriate especially through the growth periods of a puppy. Most growing Bloodhound puppies put on 3-5 pounds a week, and the greatest amount of growth happens in the 4-8 month stage. They will continue to grow for another year or two, but the 4-8 month period needs a little caution and care as the leg bones lengthen (height) and the body begins to elongate- head, spine, rib cage, etc. (length). Oh by the way, if your puppy looks like one part is growing one week, and another the next, that is not unusual, and not a cause for concern- all of the parts usually end up at the right place in the end. Keeping the above "development stage" in mind, exercise for young puppies is needed, but don’t overdo, especially on hard surfaces (asphalt, concrete, etc. ), rather go for the grassy, barked/mulched walking trails or areas on walks. If you see your puppy frequently sitting, or any limping, use it as a cue that it’s time for a break. Bloodhound puppies will in general want to play with other dogs which is a great way to exercise naturally, but be careful that they don’t irritate an older dog, or hurt them with the awfully sharp puppy teeth (which everyone will be happy to see go between 4-6 months of age). Many Bloodhound puppies have no concept of their size, so if you have other small animals, and/or toddlers, please monitor the play. 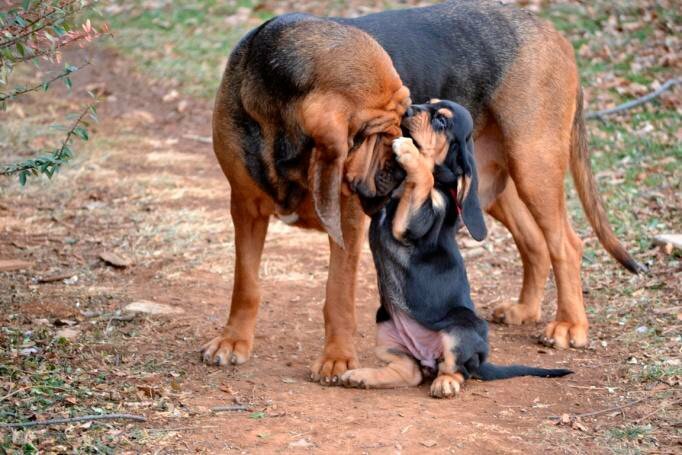 In a Bloodhound puppy’s mind, what you allow him/her to do at four months (35-45 pounds), he/she will expect to do at eight months (75-95 pounds), and into adulthood (100+ pounds), so be careful what you are teaching. The racing after your toddler or tug-o-war at puppy’s four month age is not going to be safe when 100+ pounds of dog is exuberantly coming towards your toddler (or yourself for that matter) to welcome you home, or go down the stairs, or sit on a couch, etc. Keep in mind that this breed is only “little” for a very few short months of their life, but an extra large dog for 10+ years (or longer hopefully). 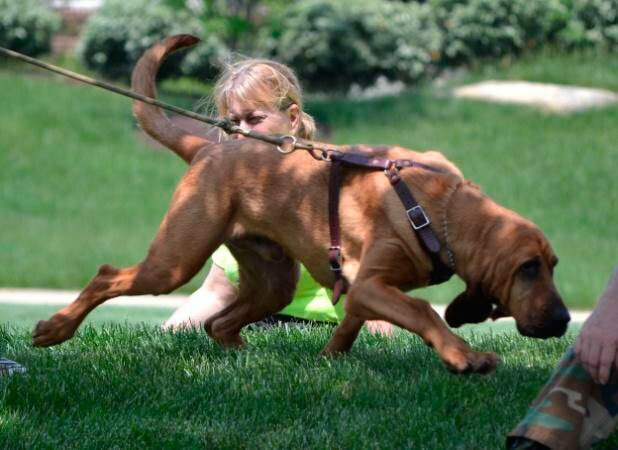 Imagine the behavior that you will want in an adult Bloodhound, and set yourself up for success in the beginning months by training, and everyone in the family reinforcing those desired behaviors from the start. It will be hard, because no one can do “pitiful,” like a little Bloodhound puppy, but stay strong and resolved, preparing for all of those adult years to come, because honestly, it is easier to correct a four month old weapon of mass destruction, then an adult Bloodhound time bomb who has learned to be boss. Remember that bell curve, well those hounds falling in the middle will need moderate to high amounts of exercise daily, while those on the left will be more of a low to moderate amount of exercise- often happy playing or running by themselves with a toy or with you. The ones on the right of that bell curve are often a challenge, because they have lots of energy to use up, and some don’t know how to do this appropriately, so you will have to help them out. You will hear Bloodhound people say that a particular hound “needs a job.” These are the high drive Bloodhounds, alpha in nature and alpha-wantto- be(s). Some feel like you have the Ever Ready Battery Bunny living with you, i.e. they keep going and going and going non-stop. In fact, with most of these high energy hounds, you will need to teach him/her to take a break, or provide a space to calm down and time-out, as they don’t know how to stop themselves, and often end up irritating the heck out of your older pets, and sometimes see you as a playmate to dominate VS leader of the pack. 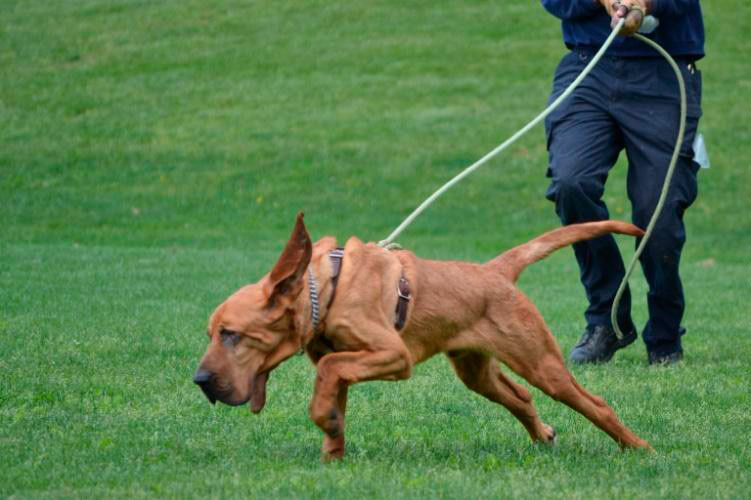 A knowledgeable breeder will place these high energy hounds in a working home where he/she will have a daily job either in law enforcement or active search and rescue. Their daily exercise will be training, working trails, and finding missing people. Unless you are an active marathon runner or Olympic athlete in cross-country, this high drive personality is not for you. In the right home these Bloodhounds are amazing, but in a home unprepared for the drive and energy, things can escalate into a really bad scene. 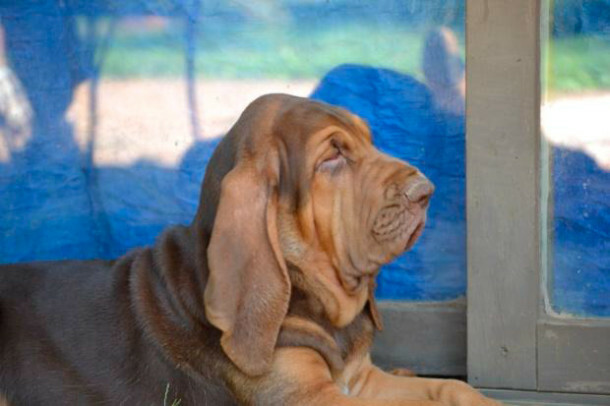 To summarize, Bloodhounds are a breed that need some form of dedicated daily exercise, but what amount will depend on where in that bell curve your hound falls energy wise, and somewhat on age: little puppy (8 weeks to 4 months), growing puppy (4 months to 8 months -greatest height and length growth), teenager (8 months to 1.5/2 years, young adult (1.5/2 years to 3/4years), mature adult (3/4 years to 7 years), senior hound (7+ years). You’ll notice some approximate ages noted by a slash mark. This is because in general, females of the breed tend to mature a little quicker than the males. The most challenging age periods to get through are the growing puppy, the teenager, and the young adult stages. Exercise will be your friend here, since a pooped Bloodhound really, really equals a happy owner. A bored Bloodhound at any age is not fun, but especially at these three stages this breed can get very destructive, chewing, digging, climbing, and redecorating your home and yard in undesirable ways. Add to this that the hormones are kicking in with the teenagers and young adults, sort of like with the human version, and life can become really stressful. 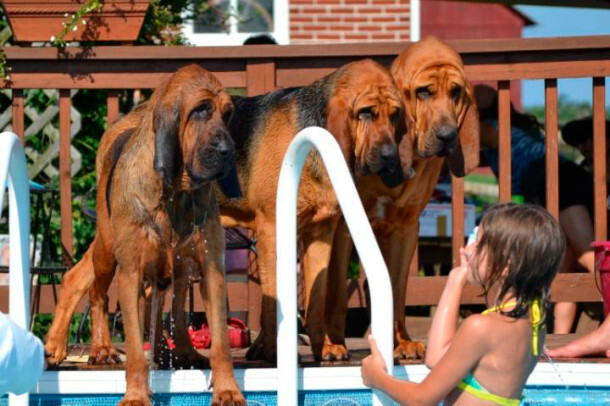 These three stages are the most common ages for Bloodhounds to end up in our breed rescue programs. Former owners say that they had no idea how active the breed is, nor how big they would get. 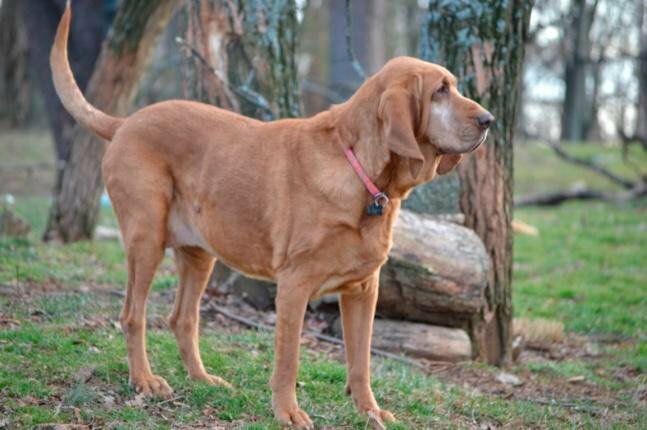 If you can not commit to two or three years of dedicated exercise and activity with a puppy/young Bloodhound, then please consider an older hound who will still need exercise, but not to the extent of a younger one. For those middle range (of the bell curve) hounds, walks, swimming, jogging (once mature), and AKC events like Tracking, Rally, Agility or the American Bloodhound Club Trailing Trials featuring the sport of mantrailing will all be enjoyed. 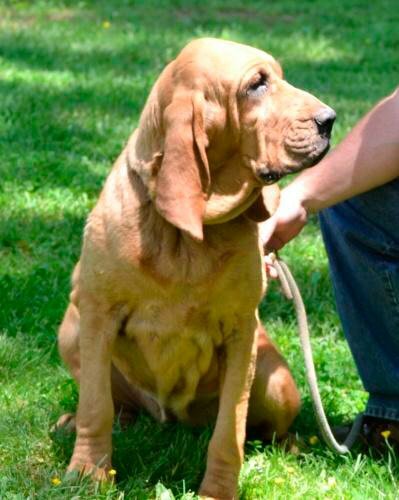 We also have Bloodhounds successful in Lure Coursing, Dock Diving, Barn Hunt tests, and competitors in Obedience. 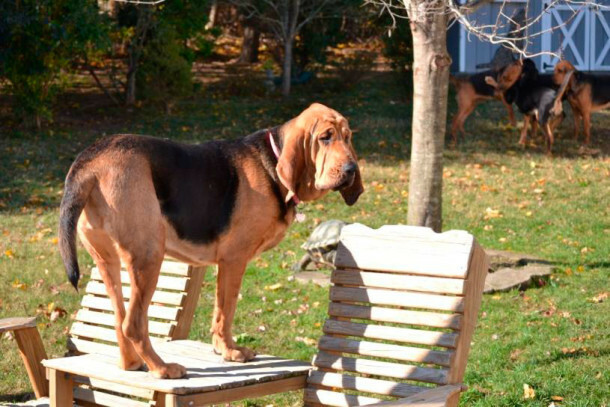 Bloodhounds are a versatile breed, and with time, patience and training, they can accomplish anything. 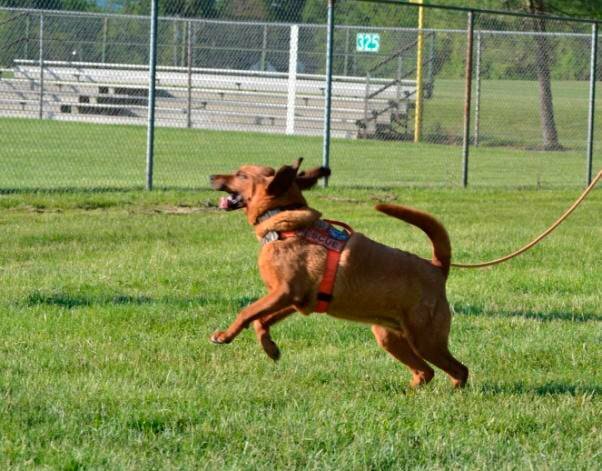 Finally, there is one thing about exercise that any Bloodhound owner must be prepared for, and that is, that activity either happens on leash, or in a securely fenced yard or dog park. A Bloodhound cannot be allowed to roam off leash, no matter if you have .1 acre or 1,000+ acres. The nose takes over, and whether crossing a highway or a field, that scenting instinct kicks in totally focusing the hound on the interesting smells and not the vehicles approaching. 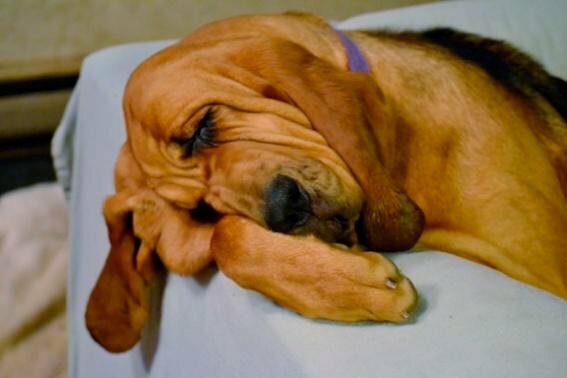 When it comes to exercise and Bloodhounds, always remember the mantra, "a pooped Bloodhound equals a happy owner." Nutrition is similar to exercise with this breed, in that age/development and the energy level of your hound will both come into consideration. Experienced, responsible breeders will provide you with a recommendation for the feeding and nutrition of your puppy, as well as recommend some brand(s) of dry food or an alternate method of feeding if they home cook food or feed a raw diet, etc. As your puppy has his/her vaccinations, your veterinarian may make some suggestions as well when looking at your Bloodhound. Likewise, use your own eyes to observe his/her condition which will indicate whether to increase or reduce food quantity. In general, you will be increasing the food quantity for a puppy as he/she grows (don’t be shocked, but some of these puppies may be eating 8-12 cups of dry food a day during a certain period in his/her development. As a general rule of thumb, provide the puppy an amount of food that he/she will eat promptly. With a little puppy (8 weeks to 12/16 weeks) you will need to feed three to four small meals through the day, and your breeder should recommend the time schedule he/she uses as a helpful guide, or if not, ask them what the feeding schedule has been, and keep to it for about a week as you transition the puppy into the feeding schedule around your work and other commitments. If you cannot come home for a midday meal, then you will need to make arrangements for someone to come over and feed the puppy. At around 12/16 weeks to 6 months, you can move to three feedings a day if not already doing so, and around 6 months through the end of your Bloodhound’s life, move to feeding twice a day. Some owners split the food and continue to feed their adult hounds three times a day, others twice with some snacks or treats in between. What you need to avoid is one large meal because of the concern of Bloat/Torsion, or GDV (gastric dilatation volvulus). By any name, these are very serious health concerns where time and condition can lead to a life/death situation. In a very, very simplified explanation here, Bloat usually describes a situation where the stomach is filling with gas and expanding, much like seeing a balloon inflate. The middle of your hound is growing and very hard to the touch like the top of a drum – get vet help. With Torsion, the stomach may or may not have expanded with gas, but the stomach itself will have flipped over like a 180 degrees or 360 degrees. You will not be able to see the turn/flip happening, but the condition is life threatening and every minute is essential – get vet help. When that stomach Bloats, the expansion creates pressure pushing other nearby organs, and with a Torsion, the flipping of the stomach cuts off blood supply, delivery of oxygen, and adds tremendous stress on the heart moving the hound into shock and finally death. 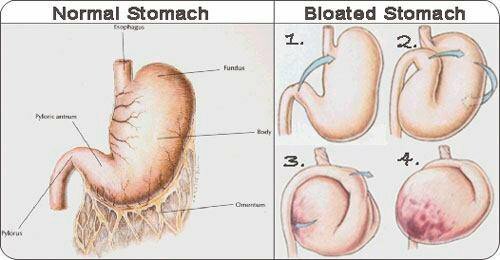 The process of Bloat and Torsion is a very painful situation and surgery is needed to correct things immediately. You may have just one condition, or you might have both conditions happening, and it is hard to tell since none of us possess X-ray vision, but again veterinary care needs to happen ASAP. Throughout the decades, many studies have been done by various well regarded veterinary institutions and individuals, but no single definitive reason for every case has been identified. There are however some precautions that Bloodhound owners can take to try to lessen the chance of either one or both conditions. First and easiest, is to split meals and feed your hound twice or more a day. Owners will soak kibble 5-10 minutes in warm water to have any dry food expansion occur before the hound eats. Many owners elevate the food dish about 8-12 inches from the ground to lessen the amount of air intake as the hound reaches to pick up the kibble and swallows. In his first study report on Bloat done in 1996, Dr. Larry Glickman, VMD, Ph.D. noted that raised food stands were used by owners of the dog breeds he was studying. He had wondered if this might also be a factor with that first study, but as he completed his second report and findings, he noted that the raised food stand did not contribute to Bloat, but just happened to be a prevalent feeding method for large, extra large, and giant breeds. A second precaution is to monitor exercise for a portion of time before and after the hound eats, avoiding jumping, leaping, running, etc. Some owners will rest their hound for a while before and after eating so that a full stomach is not jostled around. Other owners will only allow sedate activity (walking in the yard) to promote the emptying of the stomach. For owners with hounds that "inhale" their food or eat it so fast that it looks like a vacume cleaner sucking up dirt, there are food bowls specifically designed to slow down the eating and gulping of air that occurs with this style of eating. Dr. Glickman noted that dogs that are more sensitive to change or stress, may be more predisposed towards Bloat, so keeping things to a routine and schedule by feeding at the same time of day, and monitoring or reducing stresses/changes may be of help. As of this date, no specific cause for Bloat and/or Torsion has been identified, but studies continue in the hope for an answer. So, until that lucky day happens, get into the routine of watching your Bloodhound eat, and observe his/her eating habits so that you will be aware of what is normal for your dog. Once you know what is usual for him/her, then you will be able to tell what is not normal when you see it, or might be a cause for concern. As a rule of thumb, when in doubt, seek veterinary assistance- your prompt action could easily save your dog’s life. All of the above is recommended, but many owners as a way to buy some time in the event of an emergency and/or to prevent a torsion, choose to have a medical procedure called a preventative (or prophylactic) gastropexy done on each hound. Ask your vet to do this preventative medical procedure when your hound is healthy. This is the same procedure that will be done to remedy a Bloat and/or Torsion in an emergency. However, since this is an elected preventative surgery, your Bloodhound is 100% healthy at the time of the procedure. Many owners choose to have this procedure done at the time of a spay or a neuter, since the hound will be kept quiet, on leash walks, etc. for the same amount of time during recovery. It can be done at any age, but most veterinarians prefer to wait until around a year of age when the greatest percentage of growth has occurred, but if your vet is comfortable with 8 or 10 months and that is when you are scheduling other procedures, or 1.5 years and that is his/her preference, go with the time frame of his/her greatest experience. I will say that this is not a procedure for your vet to be learning about with your hound, but does require some experience. If your vet is not comfortable with this procedure, that honesty needs to be respected. The Bloodhound people living near you will often have recommendations and names of a veterinarian who is comfortable, proficient, and experienced with this surgery. Additionally, scheduling this preventative surgery when your Bloodhound is healthy, will be much, much less costly than paying for an emergency veterinary clinic surgery while your hound is in a serious life/death situation. 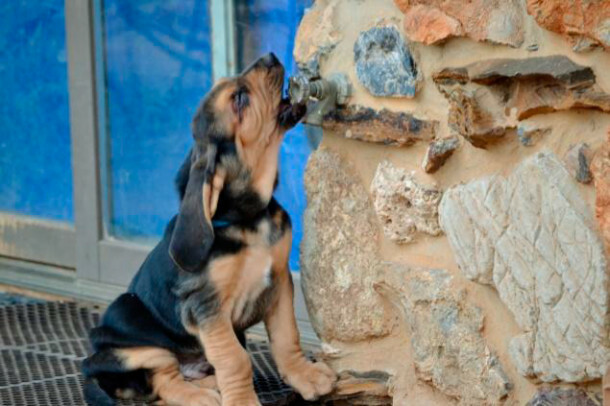 Bloodhound owners feed various types of food. If you prefer to feed a dry food, a good quality kibble should be considered. 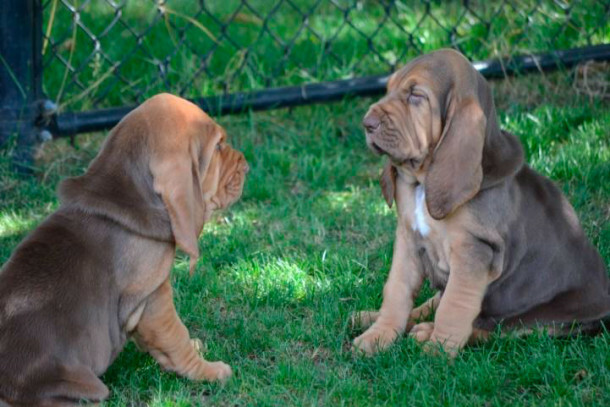 Your budget and the ease of getting that specific dry food will often determine which brand is best for you, but your breeder or other Bloodhound owners will have recommendations as well. Whether you add a supplement or not, add canned food or not, will depend on that dry food and its ingredients. It is very common now for quality dry kibble to contain pro-biotics or digestive enzymes to help with the digestive process and lessen the amount of gas produced in the stomach after a meal. If not included in the kibble, then yogurt or powdered digestive enzymes can be purchased and added to the kibble, home cooked food, or raw diet. This will help avoid Bloat. Also, check the protein, carbohydrate, and amount of fat percentages on the bag. Most Bloodhound people recommend staying in the upper 20 to lower 30 percentages for protein, and the 12 to 18 percentages for fat. Overall, you want good balance in those areas, and your specific hound’s activity level will necessitate some possible adjustment for higher or lower contents of those three. For those feeding a home cooked diet, or a raw diet, you will plan a balance through the ingredients you choose, and there are many books and websites available to help with this. We do experience some finicky eaters in this breed, most likely during the teenage and young adult stage, or about the time that the hormones start to kick in (7/8 months to 1.5/2 years). Suddenly that young puppy, who was eating like clock-work stops eating everything, leaves food behind, or doesn’t want to eat a meal. This can be a frustrating and concerning time. Obviously, rule out a medical reason first, and also that you are not over feeding your puppy, .i.e. still feeding 4 meals or three meals, or feeding more kibble than needed, or that a female nearby is not in season if it is your male Bloodhound. Your teenager will probably be eating 2/2.5/3 cups of kibble twice a day depending on brand of food, exercise and energy level. So now he/she isn’t interested in their meal. Assuming that you have kept the same feeding routine, same feeding location, same schedule, and not changed brands of food, the only way to increase that appetite is to increase exercise. Sounds counter-productive, but it works (think of athletes training- more calories burned raises the appetite and they want to eat). Add a half more mile to your daily walk, or 15 more minutes to time at the dog park, plan a longer dog play session, or add retrieving in the back yard for additional exercise time. Finally, the decision of whether to give human food or not is going to be personal preference. 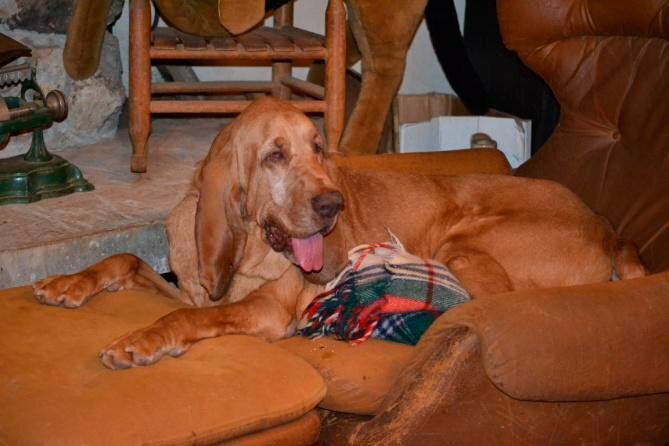 There are Bloodhounds who never receive a scrap of human food, while others have it as part of the regular diet with their kibble, or home cooked meal. Personal circumstances and choices will dictate this decision. However chocolate, nuts, onions, grapes, and other food that is toxic to canines is a definite no-no. Please be aware of what food is sitting on your kitchen counters, and table. 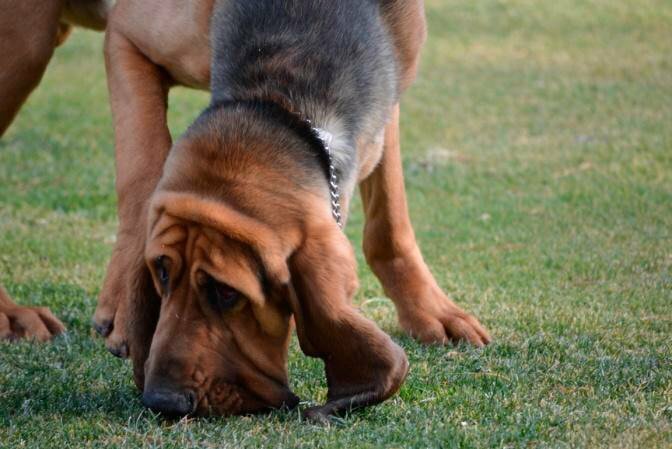 Bloodhounds are notorious shoppers, and will help themselves given the opportunity… remember the nose rules! Grooming is very important to keeping a Bloodhound healthy and really is a preventative to some costly problems both for your dog as well as your home. You will have some daily grooming to do as well as weekly grooming to do with this breed, because folks, Bloodhounds get messy, and if you keep up with things, then it is not too bad, but if you don’t, then prepare for a hit to your pocket book. The following are some daily grooming items which should become routine for any Bloodhound owner. First the eyes, which by the breed standard have a looser lozenge eye lid shape will need to be gently wiped with a Kleenex or cotton cosmetic round each morning to remove any debris around the lid. Dust and/or pollen and natural tear production come together and create an "eye goob" around the bottom rim which should not accumulate or be left to dry on the lower lids. An easy way to keep the eye lids moist and healthy, is to place a drop of mineral oil in each eye, and wipe the lids afterwards with a cotton round. 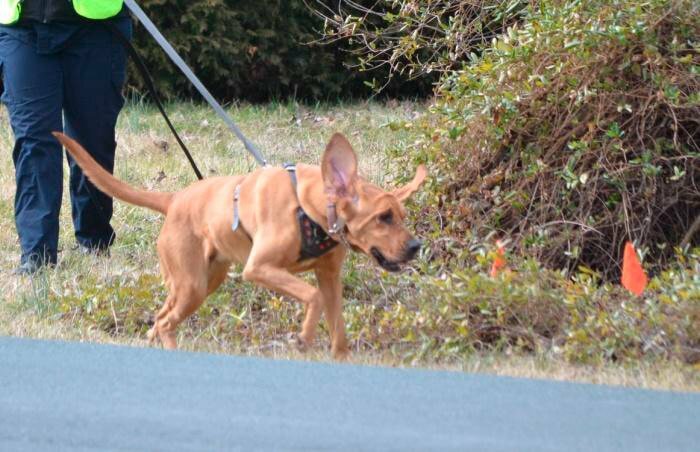 Bloodhound ears need some daily attention as well, since those long ears have tips that drag through everything. Unscented baby wipes will come in handy here to remove anything which has hitched a ride on the ear tips. The long ears can also end up in the food bowl, so after eating you will want to wipe them off, or many Bloodhound owners use an item called a snood (sort of like a hood which keeps the ears out of the food and can be washed easily). You will also want to invest in towels of all sizes, and many of these can be second hand items unless you prefer a certain color or things to coordinate with furniture. Bloodhound owners have wash cloths and hand towels all over the place for a quick wipe of any drool from those loose lips. Upon your hound entering the house, it is a good idea to wipe the mouth/lips for any drool or leaves/ sticks/ dirt that may be stuck in the flews, since a good head shake can send drool and Mother Nature’s debris quite a distance and height. A bath towel to wipe paws and underbelly especially in wet weather will save you some mopping, and carpet cleaning. 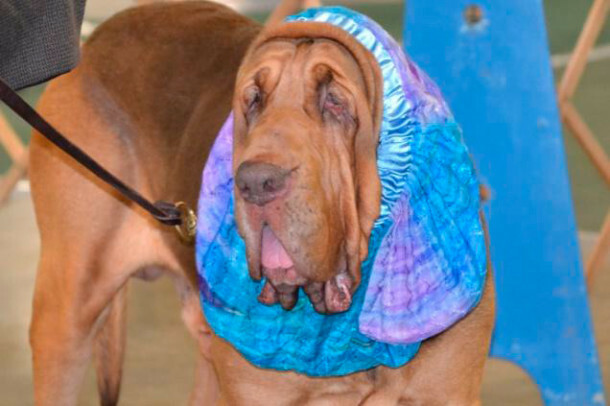 You will often see a basket with rolled towels by the back door or sliding glass door in a Bloodhound owner’s home, and most of us are programmed to carry drool towels with us in the car, to the vet’s office, to your kid’s baseball game, etc. so that a quick wipe is always possible. However, drool happens and is shared despite our best efforts, especially on hot days or after a drink of water. Experienced Bloodhound owners all know the warning sound of the head shaking and wrinkles/flews flapping as a drool is preparing to launch and land somewhere. Most often it is onto a ceiling or wall, but periodically it is into someone’s hairdo, or dinner plate. So, keep the drool towels handy, and/or hopefully your house guests will have a good sense of humor. Bloodhounds shed, how much varies with individual hounds. Some shed once a year, others twice a year in the late spring and late fall, while still others shed 365 days a year. A rubber hound glove or a grooming tool called a" Furminator" will help you tremendously. If you can, run a Furminator through your hound’s coat daily to help keep up with the loose hair. 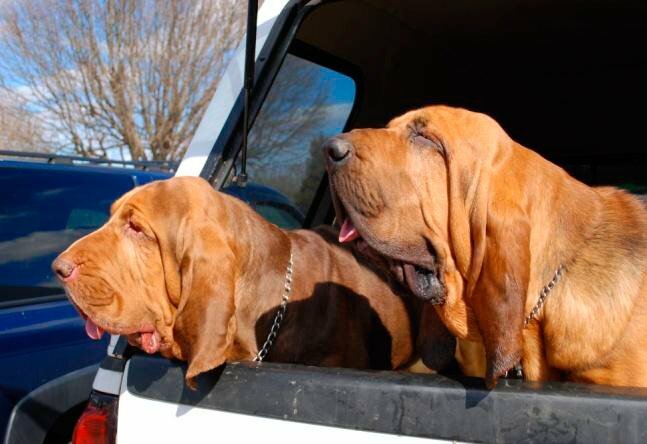 Some Bloodhound owners have even gotten their hounds used to a "Duster Buster" and vacume the loose hair out of the coat. If you keep up on the daily grooming, then the weekly grooming will be relatively uneventful, and your home won’t be as full of fur balls, drool art hanging from the ceiling, and slobber designs on the walls from head shaking. By the way, those Mr. Clean white eraser sponges are a great way to remove the later and won’t damage the paint underneath. The weekly eye routine will be the same as the daily routine, unless you are noticing some drying of the eye lids, in which case some mineral oil or baby oil poured onto a cotton cosmetic round and wiped over the eye lids to lubricate them should be done. Another option is to get some sterile ophthalmic eye ointment to lubricate the eye and capture any dust/pollen which has settled in the haw (pink area that you see). Gravity will bring any debris down, and then it can be wiped out with a Kleenex or cosmetic round. Any discharge from the eye lids which is yellow or green is a sign of a problem, as well as seeing your Bloodhound continuously itch the eye on a paw or the ground, so a call to the vet should be made. Usually a triple antibiotic eye ointment will be prescribed, but in the case of a cornea scratch or something more serious, your vet can best prescribe medication before permanent damage is done. The weekly ear cleaning will include cleaning as much of the inside of the ear, and ear canal as can safely be swabbed. This can be done in one or two ways. One way is to use unscented baby wipes, and wipe what you can easily see to capture the debris through the ridges, nooks and crannies. The next step would be to use an ear drying liquid solution, and squirt a bit into the ear canal, massage the ear, let the Bloodhound shake his/her head, and then take a cotton round and wipe out the new debris which has come up from inside the ear canal. Or, you can just use the liquid ear drying solution, squirt it in, let the Bloodhound shake his/her head, and then proceed to wipe out debris. A brown color debris is not unusual, but a tan waxy or yellow/green waxy debris color or any smell is not good, and a trip to the vet should be scheduled for evaluation and medication. In your weekly grooming, check under the chin and in the neck skin folds for any loss of hair and pinkness, or grayness. Any smell is usually a sign of a moisture problem, and as a first step for drying the area, Gold Bond powder may be of help. If you notice a lot of itchiness and scratching of this area in addition to the earlier, a trip to the vet for evaluation and medication should be done. 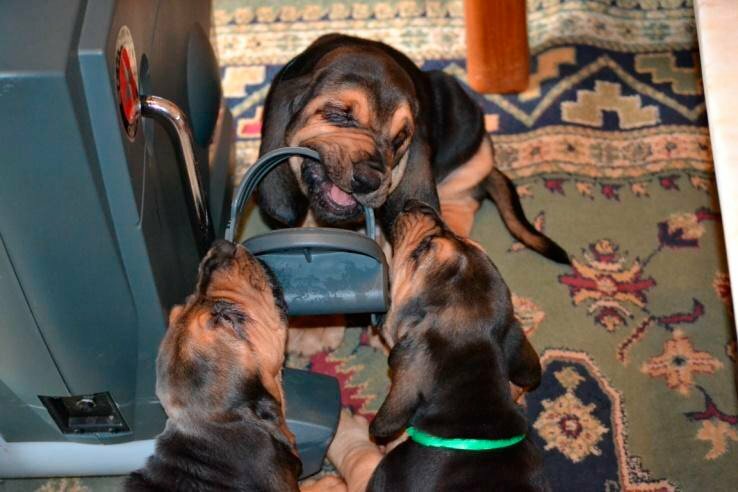 Some Bloodhounds like to fully immerse their heads in their water buckets when getting a drink, so watch this neck area for moisture and irritation. Bloodhounds need baths as part of grooming, but how often will vary individually, as some have a hound odor and an oilier coat which collects dust and dirt more frequently. If your hound has allergies, then baths will help keep him/her more comfortable. Bathe your hound with a dog shampoo and warm water, being careful to keep shampoo out of the eyes (a drop of mineral oil or ophthalmic ointment before shampooing can help with this) and take care to rinse the coat thoroughly, but especially check through the neck skin folds that all of the shampoo is well rinsed out. Towel dry your hound and then use a dryer or keep him/her in a warm area free from drafts until dry. A waterproof apron will come in handy for you to wear during baths. If your hound has calluses on the elbows or hocks, cocoa butter cream, or hand cream rubbed into the dry area, will soften the callus and skin, and in time allow for possible hair re-growth. Dental care weekly is a good rule of thumb to prevent more serious problems down the road. There are many types of dental brushes and toothpastes for dogs available on the market. Your vet can also help recommend products to control tarter build up and keep gums healthy. The subject of toenail trimming worries some owners, but this is a part of the grooming routine which is a must for preventive foot care as well. Most Bloodhounds don’t care for nail trimming, but they can be taught to tolerate the procedure through perseverance and a treat afterwards. If possible, make this a two person project, one to hold and talk to the hound, while the second trims or dremels carefully the nails. Even if your Bloodhound has had his or her toenails trimmed every week by the breeder since he/she was 3 days old (so that it is not a new experience), your Bloodhound will enter his/her new home and LIE. He/she will act like they haveneverhad a toenail trimmed, flail, scream and possibly growl. It can be a very intimidating experience and if you buy into the lie, you are going to have problems. A portion of a successful toenail trim is to remove only a small amount (about 1 mm/or 1/16th of an inch) of the nail at a time, as you need to allow the quick to recede otherwise you’ll have blood and some pain. To keep that "quick" back, trimming nails every week is the easiest solution- again, only trim a tiny amount no matter how long the nails may be- the goal is not to cut the quick. If your Bloodhound breeder acclimated your hound to a dremel, have him/her show you the process with your puppy- again only dremel a small amount of the nail to avoid sanding the quick. Stay strong and resolved, as this will be a big first test by your Bloodhound of you. Your Bloodhound will need to learn that you will ask certain things of him/her which he/she may not like, but it will all be over soon, a treat will be given at the end, and he/she will not die, but YOU may feel like a truck ran over you when it’s all over. If you trim the nails weekly a tiny amount, it will take a couple of months for the Bloodhound to figure out that this will happen despite his/her opinion, you are not trying to hurt him/her, and a treat with lots of ecstatic praise will follow. In six months, if you follow the weekly nail routine, you will find tolerance for the procedure. One puppy screamer whose toenails had never been cut by her breeder, learned trust after six months of this procedure, and went into old age holding out her paw by herself for her weekly trim. Even hounds that have won the game of not having toenails trimmed, and now bite when someone tries to cut his/her toenails, can with this process learn to tolerate the nail trimming. It will not be pleasant at first for you, but with patience and trimming just that tiny amount each week, you will in time get to tolerance and trust. In fact, the daily and weekly grooming process of cleaning eyes and ears, wiping faces, paws and underbellies, cutting toenails, etc. etc. is a key way to build trust, and have your Bloodhound used to being handled by people, especially your vet. In the case of an emergency, this will become very important for your Bloodhound to accept. Health will follow with adequate exercise, good nutrition, and routine grooming. Additionally, provide your Bloodhound with a quiet space of his/her own where he/she will not be annoyed, can eat in peace, sleep without being disturbed, and/or go to time-out and relax. This area needs to be available whether your Bloodhound is an indoor or outdoor hound. 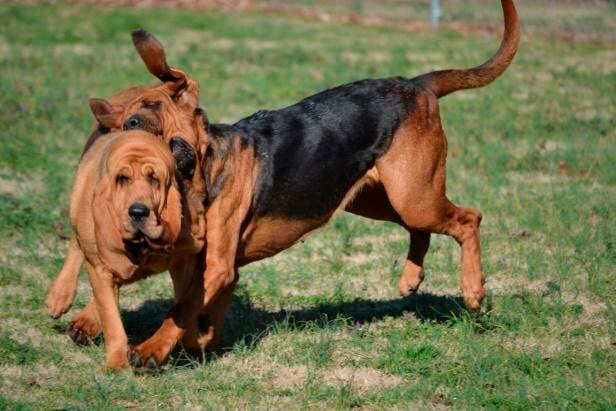 While Bloodhounds enjoy other dogs, most do not like to share their food or special toys, so provide your Bloodhound(s) separate space from each other and/or other household pets. This is also an area where toddlers and small children need to not bother the Bloodhound if he/she is eating or sleeping, therefore avoiding any accidents. 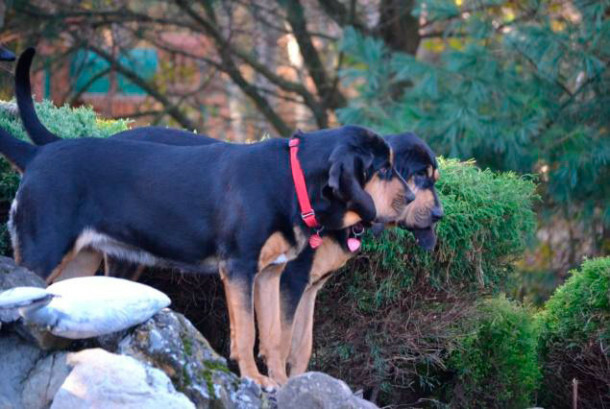 All Bloodhounds need a securely fenced outdoor area to exercise. Chain link with posts in concrete or treated wood posts with the wire on the inside has proven the most secure. If your Bloodhound will primarily be an outdoor dog, or will be outside while you are at work, a heavy gage 6’ chain link kennel run in a shaded area of the yard will keep your Bloodhound safe while you are away. Owners have various preferences for the surface of the dog run – but keep in mind drainage and parasite control is key. Some owners will use pea gravel (small rocks which can easily pass through if accidentally ingested), concrete slabs, or a sand base for leveling and then concrete square/rectangular blocks to elevate on top. A dog house appropriately insulated for the climate and temperatures in your area must be available. Length of the run is more important than the width of the kennel run. Some Bloodhounds are climbers, so a 6’ high chain link area will insure that your Bloodhound will still be there when you get home. The perimeter of your yard fencing may be fine at 4’ or 5’, but if you plan on having the hound in the yard unattended, then a 6’ height is worth the added expense for peace of mind. For the digger or climber, an electric perimeter wire respectively up or down will discourage the behavior and again insure that your hound remains in a secure and contained place. 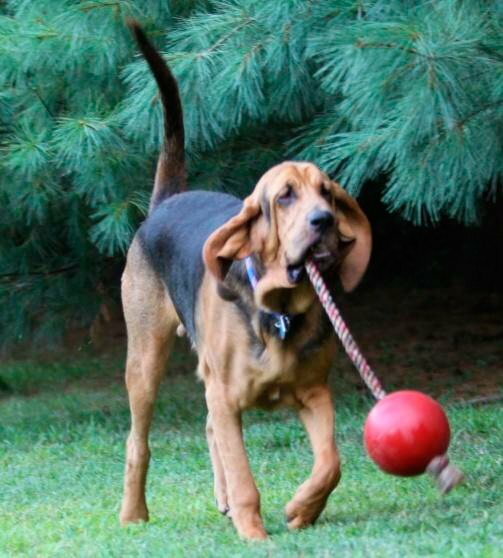 Whether your Bloodhound is in an outdoor kennel run, a securely fenced yard or inside the home in a crate or safe room, your Bloodhound will need specific and dedicated exercise time and interaction with you daily. Most Bloodhounds do poorly as a solitary dog, and all of them need interactions, socialization and acclimation away from home. 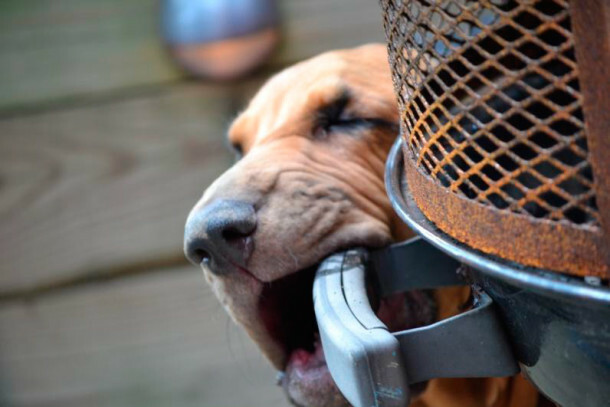 Because Bloodhounds drool and are messy, you need to be aware of cleanliness when it comes to bedding, food bowls, water buckets, etc. Choose bedding materials which can easily be washed, and a sheet over the couch or loveseat which can be washed will help keep your furniture looking better and smelling less "houndy". Scrub stainless steel dog bowls and water buckets with dish soap and hot water after each meal to remove the layer of drool. You will notice that stainless steel water buckets not bowls are preferred, with fresh clean water available at all times, since many Bloodhounds like to scuba dive in their water buckets, so if indoors, a towel underneath the bucket or surface which can get wet and easily wiped up is needed. Outdoors, it is wise to clip your water bucket to a fence or wire, since some Bloodhounds enjoy tipping over the bucket and walking through the new stream. Kiddie-pools are also very popular with Bloodhounds through the hot summer months. 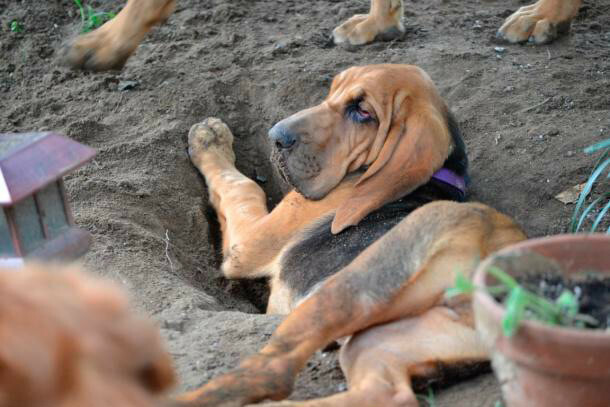 Bloodhounds are very observant, and several are escape artists. A metal clip in a chain link door latch, or fence gate door latch is a must. Think twice about ice makers on the outside of your refrigerator door, Bloodhounds love to work the buttons and have ice cubes to play with or fresh chilled water with the push of a nose/paw. Their nose will seek anything that you have recently touched, so if it is valuable, keep it 5’ or higher, and/or behind a closed or closet door. If in a pinch, put valuable items or food stuff inside the microwave or oven if you need to leave the room. Kid’s toys can be very tempting for a Bloodhound, so use caution. Silence or crunching is not a good sign, but a call to investigation. 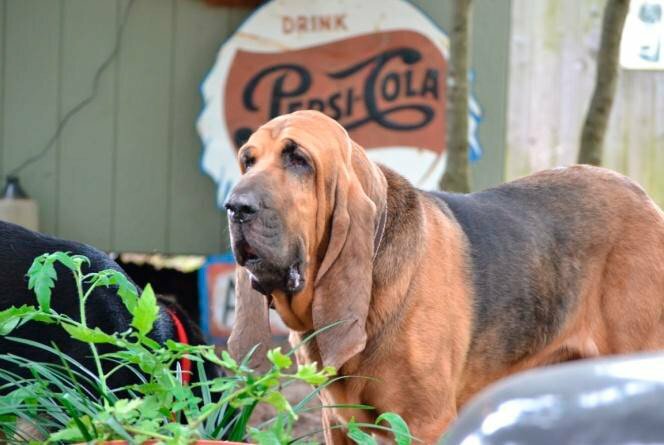 Bloodhounds have other idiosyncrasies, so there are many groups on Facebook available as a resource for Bloodhound owners as well the American Bloodhound Club website. Bloodhound people enjoy talking about this breed and answering questions, so reach out and connect. Regional clubs are nearby and offer many activities for you and your hound. Glaucoma: Time to look past the eyelids! The main objectives of the American Bloodhound Club are the preservation and protection of the breed and improvement of the character and conformation of the Bloodhound as described in the official AKC breed standard. Copyright © 2019 American Bloodhound Club. All rights reserved. || Designed by Blue Ridge Graphics of NC & Showtime Design of DE.